Oh my goodness. It is getting so close! I'm excited for you guys! You and Grayson are both looking pretty adorable! Getting close!I think the second time around you mostly realize how LITTLE you actually need for a baby, and you kind of learn to streamline. You'll do great!Oh, I know what you may need. A larger diaper bag. I kind of loved my Skip Hop Duo Double with the two babies, I could pack a ton in there. Woo hoooooo for the third trimester! I can't believe you're already there! Crazy! And I think all your concerns are TOTALLY valid. I want to have another baby like crazy but that doesn't mean I'm not totally terrified of the reality of it. Seriously. If I ever manage to be staring the arrival of a second child in the face I'll be quaking in my boots. And my daughter requires way less effort than G. But you're going to do a great job. I have no doubt. If anyone can do this, you can. 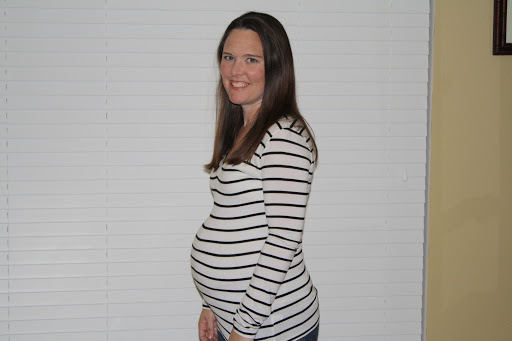 "Just because he's cute…" Darned right!I can't believe you're already in the third trimester. Your pregnancy has gone by really fast (for me, anyway!). I'm anxious to hear what you have! 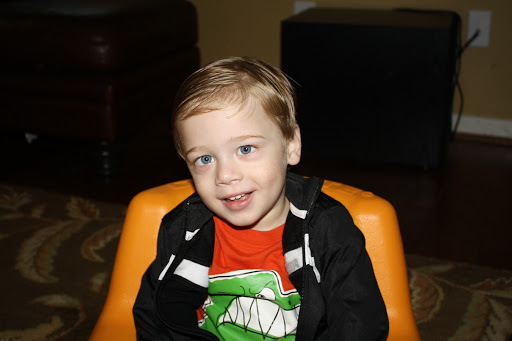 You look GREAT and Grayson…well, he's just too cute! We need to talk. I was in your exact same situation, so I know the concerns and fears you're having! Give me a call! Seriously! How can you already be in the 3rd trimester??!! You look adorable, btw 🙂 And G always does. I can't believe you're in the 3rd tri already – congrats!! !You look absolutely adorable. 🙂 Your hair looks so different as well – wow! I pray that you get an "easy" baby this time and that it goes much better than expected!!! Graham is WAY wasier on a rough day than Paisley ever was on a good day so for me, two isn't much different than one. Can't wait to see what you're baking!!! You look gorgeous!!! You are seriously the most beautiful preggo woman EVER!